A few years ago, I spotted Linda Rodin walking briskly along Christopher Street in Manhattan. She looked slim and energetic, clad in minimalist black (including dark sunglasses), with her silver hair pulled back in a twist and her smile accented by shocking pink lipstick. I admired her style, and I privately regretted (not for the first time) that I just couldn't enjoy her signature Olio Lusso facial oil. My skin likes its formula, but my nose detests its raw, indolic jasmine scent. When Rodin released her first fragrance, Rodin Perfume, I skipped it because it was supposed to smell just like Olio Lusso. (Shudder.) Her second fragrance, Bis, somehow escaped my notice. Her most recent launch, Rodin 3, caught my attention with its promise of being "a personal throwback to her favorite breezy, fresh scents of the 1970s. . .lingering gently with a touch of nostalgia." I added it to my sample order list. Rodin 3 includes notes of geranium, jasmine grandiflora, ylang ylang, orris, sandalwood, patchouli and musk, and it's offered as a "refreshing" Eau de Toilette. To my nose, it starts with a very green and pleasantly bitter mix of bergamot and galbanum. The jasmine note is minimal, thank goodness, and registers more as "white floral" among the sharp herbal mix. Rodin 3 rings out loud and clear (and still very green!) on my skin for three hours, with plenty of sillage for that first hour or so. Then it goes duskier and muskier, with some earthy iris root and a mossy base that stays closer to the skin. It could easily be worn by men as well as women. If you're a fan of fresh green chypres from the 1970s, like Ô de Lancôme (okay, 1969!) and Estée Lauder Aliage (1972), or more floral-green chypres like Estée Lauder Private Collection (1973), you very well may enjoy wearing Rodin 3. Are we about to experience a wave of green chypres? (I'm thinking of Angela's recent review of Papillon Dryad.) If so, I'm on board. Rodin 3 has plenty of vintage-inspired character, yet it's still translucent enough to be worn on a warm day in 2017, perhaps for a stroll through Greenwich Village. 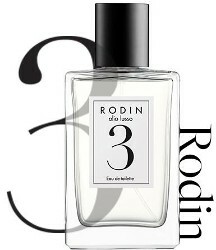 Rodin 3 is available as 100 ml Eau de Toilette ($170) at Barneys and Luckyscent. It sounds like a very wearable scent – and with a hint of personality. Nice review. Looking forward to more green chypres, too. I can’t full off big, full-bodied chypres — but this one is interesting yet contemporary, and just sheer enough that I can make it work on me! Not a green chypre fan, but still happy to have more sophisticated choices around. And always happy to hear about someone closer to my age who is stylish and successful! Yes to that latter point!! I so hope there’s a green-chypre renaissance on the horizon! I love my unintentionally vintage Ô de Lancôme (not sure about the more recent formulations). It’s so good! “Unintentionally vintage,” hah — I think I have a few bottles that fit that description by now! Sounds delightful! Bis is awesome, by the way; you should check that one out, as well. Count me in for the 70s green chypre revival, also. Now that I’ve read the Bis description (and its concept), I do think I would like it! Next sample order…! Sounds like heaven! Can’t wait to try it. I like green chypre scents- and love the elegant, retro vibe they have. I like jasmine and so I liked Rodin, but this may be worth seeking out ! Sounds interesting, and agree we could definitely benefit from a green wave.